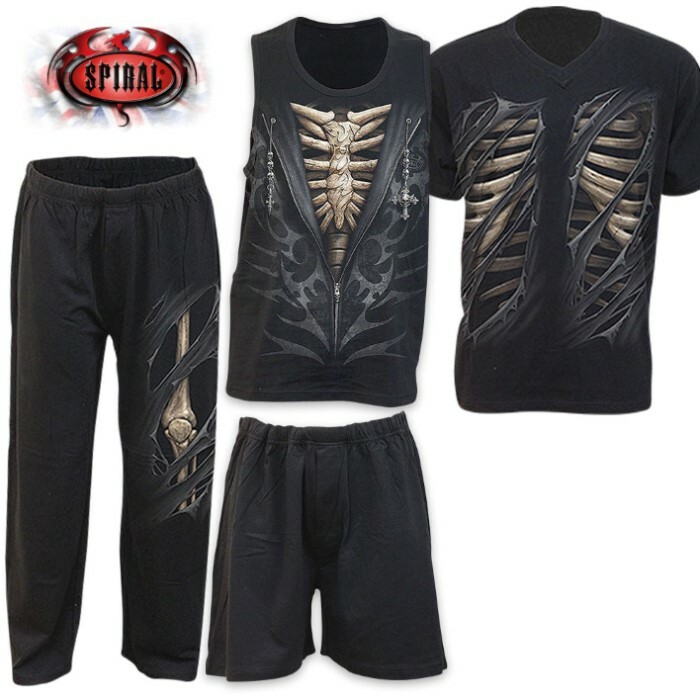 Bone Rips 4-Piece Men's Gothic Pajama Set | BUDK.com - Knives & Swords At The Lowest Prices! Look like Death warmed-up in this killer Gothic inspired four-piece pajama set! The skeletal and slashed design elements feature a peek-through, 3D look. You get both a winter and summer set of pajamas made of top-quality, 100% cotton jersey. The detailed, original artwork is done with skin-friendly Azo-free reactive dyes. Add that touch of Gothic elegance to your wardrobe with this incredibly comfortable, great-looking pajama set.